Style and performance in a tight package. 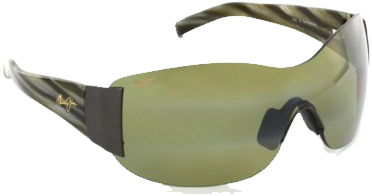 These shades from Maui Jim may not have been my first choice from an aesthetic perspective, but after wearing them for a while, I realized that they provide EPIC protection. The full shield design of the lens stop any stray light from sneaking in. More than just the light they keep the rest of Mother Nature's assaults at bay as well; wind, rain and snow have been no challenge. Armed with the Maui HT (High Transmission) lens technology, early mornings on the water and sunset runs are no longer an issue. They were designed for situations where most lenses would be too dark, and put an end to the on-again off-again, back and forth you normally deal with. Hitting the slopes on an overcast afternoon? These are ready to play. The fit is about as good as it gets. They stay glued to your face thanks to the design of the arms and the super sticky nose pad. WARNING Highly Scientific Testing: I stuck my head out the window of my truck at 60 MPH to see what would happen. These things didn't wiggle and I could see perfectly. Tears would have been streaming down my face with most normal glasses, if they didn't blow off completely. It is no secret that I have a sunglass obsession and Maui Jim is on my uber-short list. From the design of the frames to the lens material, you are hard pressed to find anything better.